At that time, being mid-November of 1989, I had just brought a 93-foot yacht down from New York to participate in that particular year’s holiday boat parade, start a cosmetic work project, and offer her services for some charter work. Meanwhile, along with his lifelong friend Alan Brown, John, with whom he had spent many high school holiday times in Majorca, Spain and in the South of England, decided it was time they paid a visit to the U.S. of A. After getting all the proper documents together, and booking their plane tickets, the lads were off. They flew from London to New York and then, after meeting up with several friends, traveled to Orlando and then to Miami where John found work at a car wash. Quickly deciding there was little future in this industry, he and Alan tried their hands at washing boats and soon migrated a bit to the north and Ft. Lauderdale. The very night of the boat parade, someone they had just finished up some work with was sporting the boys to a dinner at the Bahia Cabana, a popular local watering hole serving relatively decent fare. And as fate would have it, my crew and I, having just gotten back to the dock and with things squared away, decided to do-drop-in. 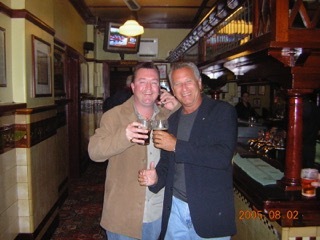 Several beers later, I was introduced to John and Alan by the person they had been working for; who, by the way, I knew casually, and as I was looking for two crew, took them down to the boat for a look-see. “We’re sorted, Alan and I, and, tired of cheese and bread sandwiches, have decided to come aboard.” They set up the forward quarters to their liking and for the next three months, turned out to be stellar crew. Come spring, the boat returned to New York and the boys were off to England. A true kindred spirit and fellow sufferer of terminal wanderlust, John returned to the States in the summer of 1990 and began an almost two year travel odyssey taking him from finding work in Bar Harbor, Maine, to Barbados, to Sweden, and finally, on a one-way ticket, to Australia. After three weeks of picking grapes at a local vineyard, and his total assets of $70 just about exhausted, he landed a job, having had some background in the past working with Alan, as a security technician. Since then, John now heads up his own successful company, Vision Security Services, and went on to develop the QCamPro App. In 2005, while attending the Sanctuary Cove Boat Show in Sydney Harbor, Australia, John and I were able to catch up, and in 2013/2014 he attended the Ft. Lauderdale and Miami International Boat Shows, QCamPro in hand, for its Stateside launch. While attending these two premier shows, he was in contact with top integration partners such as Mobotix, AXIS and FLIR. The QCamPro App is now spanning across the globe in 60+ different countries with 30+ companies ‘branding’ the app as their own. 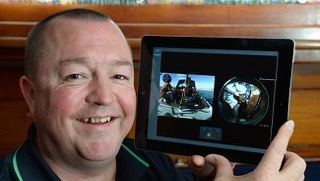 John proudly displays his app, QCamPro. motivated and visionary entrepreneur was behind this product. At the same time, I believe full disclosure is in order and given my background with John, did not want our friendship to get in the way of helping him get the word out. To the point, I have no stake in the company and neither have nor will receive any compensation for this report. As with other relevant products that come across my desk, this information deserves to be shared by my readers. So, let’s get into it. Many have grappled with the concept of remotely monitoring video cameras or being alerted when a virtual staff member, marina manager, dockmaster, or security officer first detects activity on a protected site. The notification comes if there’s a problem onboard or site changes like a spike in temperature, perhaps indicating a fire, a power failure, or some other indication that something is wrong. 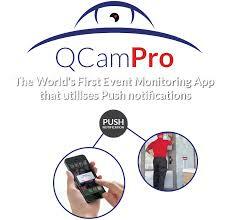 QCamPro works very much like an alarm system with one big difference: You receive a visual ‘push’ notification direct to your IOS device allowing you to have live video and two-way voice communication with speaker-equipped cameras when an event occurs (Android App is available but without event notification). With this app, you can have remote video security right in your hands. And as far as camera compatibility is concerned, QCamPro works with the full Mobotix range, including the new T25, Q25 and S15 models, Axis, Bosch, Panasonic, Sony, DLink, Grandstream, Toshiba, and Vivotek equipment. During my time with John at both the Lauderdale and Miami shows, I personally watched as he powered up an iPad and checked in on a boat at a marina in Sydney Harbor, Australia, in real time, remotely controlling the lights onboard through QCamPro. The majority of camera/surveillance systems have their own app that allows you to have a look whenever it suits you. QCamPro also allows you to use this but the key feature is it ‘notifies you’ when an event occurs. 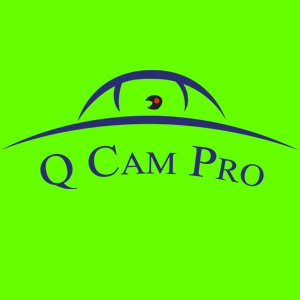 Rather than have multiple apps for multiple sites, QCamPro has a multi-view option allowing different cameras to be set up in different camera layouts across multiple sites. Other key features include live monitoring of video and audio across both 3G and wireless, a speak-to-camera function with frame rates as high as 25 frames per second depending on the camera and network configuration, PTZ controls, native IOS controls (multitouch zoom, swipe, etc), single, and multi-view of cameras, including a 16 camera view assigned to groups with no limit on the number of cameras or views that can be monitored, six action configuration to open doors, switch lights on and off, etc., and playback of recorded video and audio (not yet available on Android).